Best known for his high-profile stints in Yes and King Crimson, drummer Bill Bruford has been taking little vacations from his day job for something like two decades now. 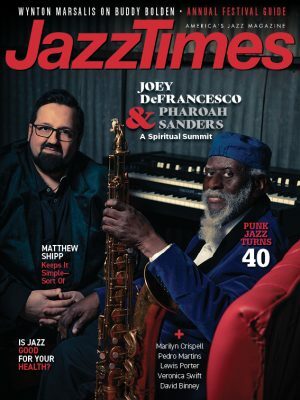 With each of his successive side projects, he’s edged closer to the trappings of mainstream jazz, stripping away the electronics and gimmicks until finally, on The Sound of Surprise, what’s left is the very foundation of the tradition: a saxophone, a piano, a bass and a drum kit. Even in this context, however, Bruford remains unmistakable to anyone who knows his previous work. 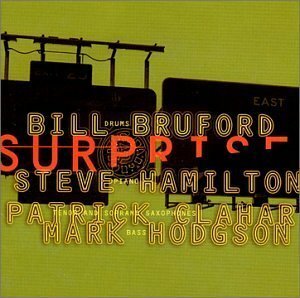 A friend once aptly stated that Bruford’s snare drum is as recognizable as Miles Davis’ Harmon-muted trumpet. The crisp timekeeping and muscular fills of his rock work are also very much in evidence. A penchant for tricky time signatures continues to inform his writing; it’s not impossible to imagine such quirky uptempo tunes as “Revel Without a Pause” and “Cloud Cuckoo Land” fitting neatly on one of his records from the late ’70s. The ballads are frequently another matter; the lovely, limpid “Come to Dust” wouldn’t feel out of place on a Branford Marsalis disc. After two years of gigging and recording, Bruford’s bandmates sound more assured, and thus better equipped to help the leader’s music relax and breathe. Saxophonist Patrick Clahar plays across Bruford’s tight rhythm figures on “Triplicity” with casual ease, while pianist Steve Hamilton stands out on “Half Life,” his lyricism undaunted by the restlessly shifting structure. Both dance like dervishes in the modal melody of “The Wooden Man Sings, and the Stone Woman Dances.” The result is far and away Bruford’s most convincing jazz work to date.